VULTURES VENGEANCE: new 7” and shirt, preorder starts now. 2-track 7” “Lyrids: Warning from the Reign of the Untold” features 2 previously unreleased songs only available on this release. 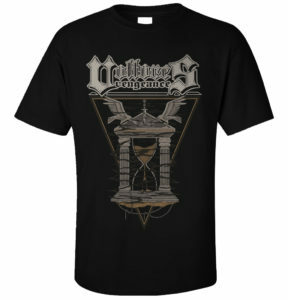 The “Temple of Time” t-shirt features an exclusive design by Dan Capp! 4-color print on black, heavy cotton Fruit Of The Loom t-shirt. Both products will be available by Sept 3st. You can preorder the 7” and shirt separately. Or as a bundle and save € 2,00. The legend of Vultures Vengeance began in 2015 when the Italian epic metallers released their Rising demo tape. Limited to only 150 copies, Rising quickly sold out when influential German metal magazine Deaf Forever gave the demo a glowing review. Word of mouth on Vultures Vengeance (who feature guitarist/vocalist Tony T. Steele, new lead guitarist Tony L.A., bassist Matt Savage and drummer Kosathral Khel) traveled fast, leading all the way up to Gates of Hell Records, who signed the band in 2016 for the release of their Where the Time Dwelt In EP. Like Rising, Where the Time Dwelt In earned Vultures Vengeance significant praise in European metal circles. Since then, the band has worked in new lead guitarist Tony L.A., and has been ensconced in a recording studio working on their first full-length album, which is set for release sometime in 2019. In the meantime, the band is treating fans to two leftover songs from the Where the Time Dwelt In EP on the Lyrids: Warning from the Reign of the Untold 7-inch. The songs — “Empire of the Crimson Fields” and “Into the Cave” — were recorded during a separate studio session from Where the Time Dwelt In, but follow in the sonic path of the cuts from the EP. “Into the Cave” is inspired by the “cave myth” from Plato, while “Empires of the Crimson Fields” features a two-part narrative that tells the story of a noble family awaiting of the birth of the new king. The family eventually conquers an empire, but starts savaging the natives, which is where the story shifts to a commoner who has watched his son killed and his land destroyed. The pain and prayers from this man are eventually heard, placing a curse upon the kingdom. Their points of view converge at the song’s conclusion where both fall into the face of death, neither receiving clarity. 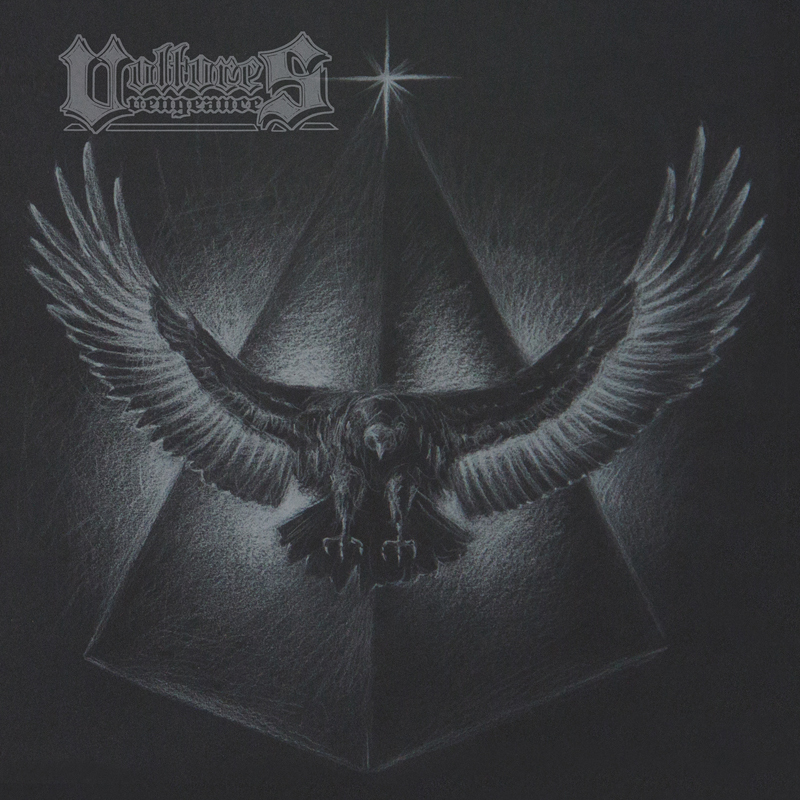 The two songs are climatic bodies of work, drawing from a wide range of influences from classic NWOBHM, thrash and power metal, crystallized with a warm, but raw production job, capturing the feeling and aura of Vultures Vengeance’s decade of choice, the 1980s. It is here where Vultures Vengeance is able to successfully toe the line between nostalgia and their own take of vintage, fantasy-based heavy metal. Fans of Omen, Steel Assassin and Liege Lord will no doubt feel at home.